The Forest Open Day, which emphasized the keyword “conservation” in the minds of stakeholders, was organized by the IITA Forest Unit on 26 October at IITA, Ibadan, to showcase donor-funded facilities and highlight the activities of the Forest Unit over the past seven years. 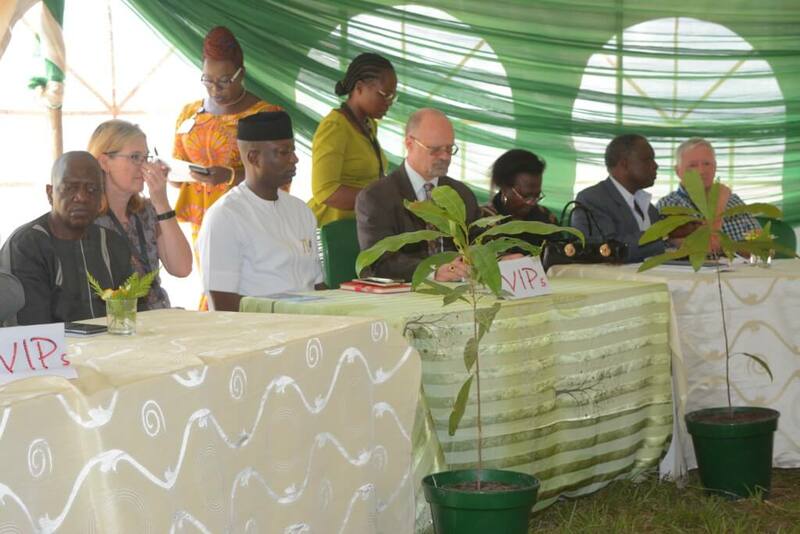 IITA Management and dignitaries during the opening program of the Forest Unit Open Day. 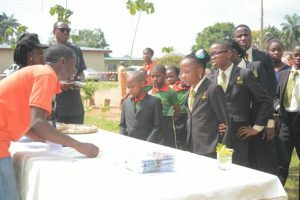 This first ever Open Day was attended by representatives from the Leventis Foundation, Forestry Research Institute of Nigeria (FRIN), Nigerian Conservation Foundation (NCF), Centre for Environment, Renewable Natural Resources Management and Research (CENRAD), and the Australian High Commission as well as students from the Olive Branch School, Ansar-Ud-Deen High School, Ekiti Mobil Grammar School, Saint Catherine’s College, and the International School of IITA. The event aimed to bring together national, regional, and international partners to raise awareness on the need for sustainable management of natural resources, support wider biodiversity, and build capacity for tree conservation. From 1990 to 2005, Nigeria lost 21% of its forests, earning the reputation of having the highest rate of deforestation in the world. Such rapid deforestation resulted in an average temperature rise of 1.1% and a decrease in annual rainfall of 81 mm. Forest cover is now down to 4% yet there are few initiatives on reforestation or protection; and at this rate, Nigeria’s forest will be gone by 2020 if steps are not taken to conserve the remaining resources. Speaking at the opening ceremony, Kenton Dashiell, IITA Deputy Director General, Partnerships for Delivery, applauded all the participants for their contributions and dedication towards making the occasion a success. “This is the first Unit Open Day, and I am happy to celebrate with them. The Forest Unit has worked tirelessly to ensure that IITA’s forest and its habitats are not threatened, and I encourage you all to be movers of conservation,” he stated. 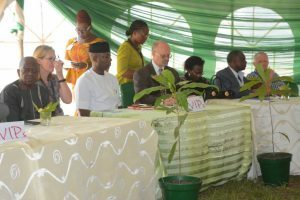 In addition, Deni Bown, Head, IITA Forest Unit and focal point for the event, emphasized the importance of collaborative effort, partnership, and commitment to prioritize and protect Nigeria’s most threatened trees for the continuous interdependence of people and nature. The meeting ended with a tour of the Nursery and Ethnobotanical Garden.